A confession: I do not read Dinosaur Comics, by Ryan North. I have nothing against those comics, mind you. I am quite tickled by the concept of it all – I was simply never able to get into it. Part of it, perhaps, is the intimidating archive, especially given the nature of the material. I know, I know – I wouldn’t need to get into the archive to read the strip. There isn’t continuity to worry about, or storylines to follow. Each strip is self-sustaining, and I could join the readership anytime, anywhere. But the strips I read didn’t really work for me, and it didn’t feel like it would be a complete comic without acknowledging the archives. Hence, I’ve never read Dinosaur Comics. But there is a newcomer in town. 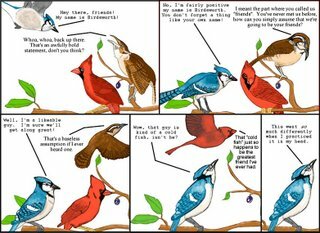 Birdsworth Comics, done by fellow webcomic’s blogger Gilead Pellaeon, has just begun. Right now there is one – count ’em, one – strip in the archives. So, a good piece of artwork. The first one is also well written, which in no way hurts. I know from his blogging that Gilead is a high class writer, so I have confidence in his abilities to continue producing such quality. The birds themselves establish an exceptional amount of personality in just the first strip. I don’t know if the strip will be engaging in such shenanigans as continuity… but it is still nice to have some actual flavor to the characters. In any case, I’m excited about one of these fixed art strips, especially one full of such promise, starting while I can get in on the ground floor. He’s already got a month long buffer, which is a sure sign of professionalism. My webcomic reading time is at a premium these days, and I have been trying to trim down, rather than expand, my list – but Birdsworth easily found itself a spot. Here’s looking forward to more to come!